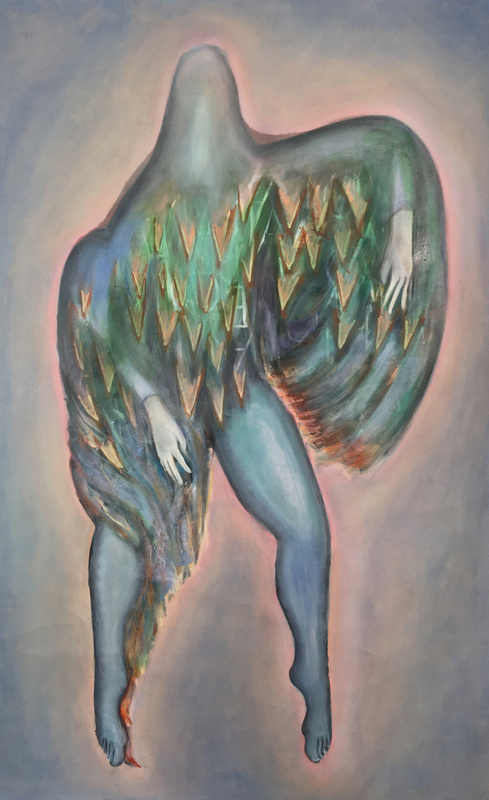 Tatiana Trouvé’s The Shaman, 2018. Courtesy of Kamel Mennour. Whether it was the air conditioning or an increased number of windows, there was much talk about how enjoyable people are finding Frieze London this year. While there are the usual blue chip, big hitters on view there was also a good showing from up-and-coming galleries like Arcadia Missa and Union Pacific. A sense of emerging trend redressed the balance of the marketplace. These fresh visuals and ideas were a good reminder of why we all flock to Regents Park year on year. Here are some of the best booths and standout artists this year. 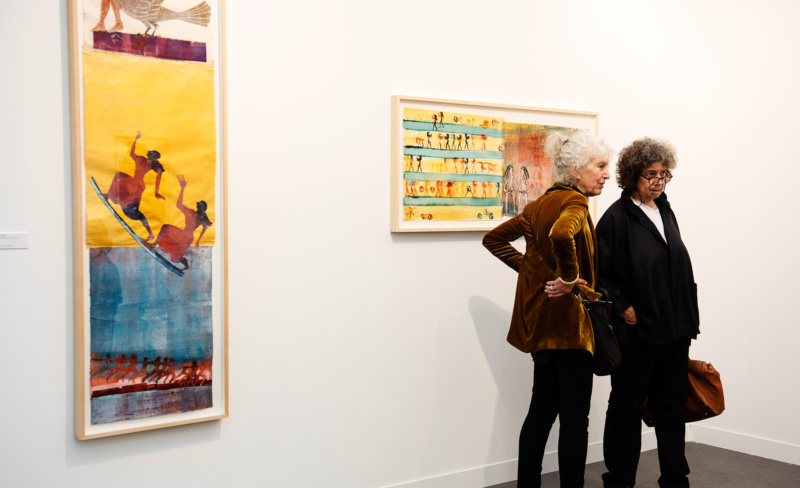 Nancy Spero, Galerie Lelong, Social Work, Frieze London 2018. Photo by Linda Nylind. Courtesy of Linda Nylind/Frieze. This new section of the fair is dedicated to female artists who were prolific during the 1980s and ’90s when male artists dominated the scene. Featuring Mary Kelly, Sonia Boyce, Helen Chadwick, Ipek Duben, Tina Keane, Faith Ringgold, Berni Searle and Nancy Spero, this section is a must. Mathilde Rosier’s Blind Swim 11, 2017. Courtesy The Breeder, Athens. Athens-based gallery The Breeder has a fantastic selection of contemporary sculpture, painting and installation. On view you can see work by artists Maria Hassabi, Jannis Varelas, Alexandros Vasmoulakis and Mathilde Rosier, giving a snapshot of artists working both within and outside of Greece. Artist Sean Steadman’s work at Project Native Informant. Courtesy of the gallery. Steadman’s accomplished paintings comprise both technical ability and forward-leaning abstraction. Nodding to the trend of complex uses of color, Steadman has his own visual language that is developing into something really exciting. Royal Academy graduate Rebecca Ackroyd is a star on the rise. Not only is she showing both painting and sculpture with her gallery Peres Projects at the fair, she also has a permanent work installed in Selfridge’s department store. Her layered work encompasses humor, surrealism and a feminist message. The Shaman by French conceptual artist Trouvé is a literal oasis in the midst of the intensity of Frieze. A tree pushing up through concrete and flowing water creates a sense of peace and a thinking point in the chaos. If you have the space for this work, it will set you back just a cool €650,000. 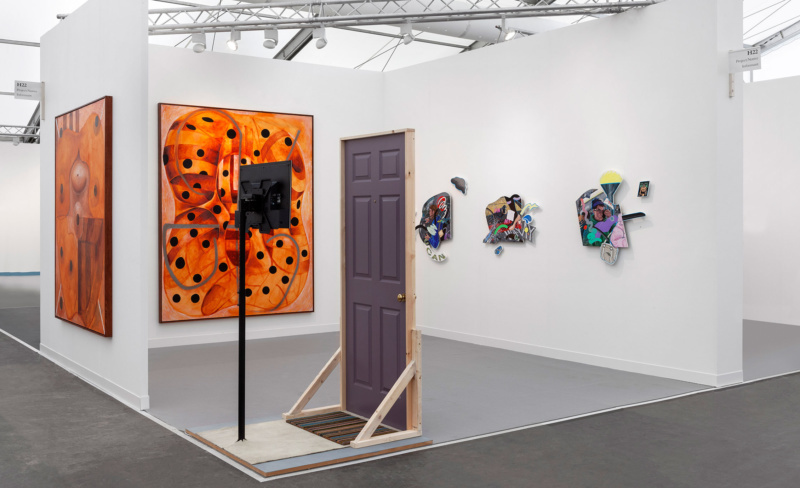 Installation view Stephen Friedman Gallery at Frieze London 2018. Courtesy Stephen Friedman Gallery. Photo by Mark Blower. Stephen Friedman’s solo booth, featuring the deadpan illustrator David Shrigley, is the Instagram moment of the fair. Incorporating film, illustration and news slogan posters from the beloved British artist, this concept was destined to be a winner. The booth also features outward facing neons of Shrigley’s slogans such as “Distractions, Distractions, Distractions” and “My Artwork is Terrible and I am a Very Bad Person” that are attention-seeking yet endearingly self-deprecating. 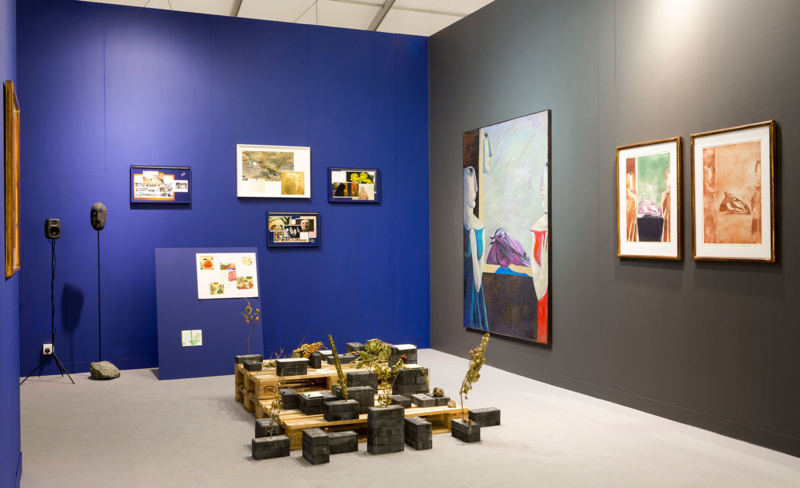 Gypsum booth at Frieze London 2018. Photo by Renato Ghiazza. This Cairo-based gallery is one of few dealing in conceptual art in Egypt. 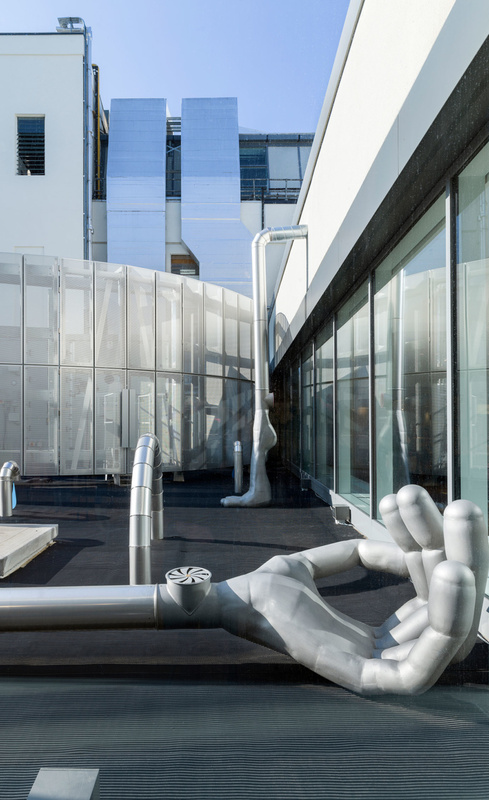 As the country rebuilds its museum and gallery infrastructure, Gypsum gives us a taste of the contemporary scene.